Hello everyone, hows the kick off of the week going at your end? I woke up at 5 am today because our little princess will be attending Vacation Bible Study at St. Jose's. The "All Hands on Deck" four day event is dubbed as the "High Seas Expedition: Exploring the Mighty Love of God." I thought I would be able to blog before they woke up but after I coked breakfast, they all woke up lol. We walked her down at the school, singed her in, and then we left when they were about to start. I am thankful that our great neighbor are one of the volunteers who will help the kids (Thanks Sara and LIz). Rylie was happy too because she doesn't know anyone in there yet, so having the lovely ladies around is a great relief for her (and for me too). Anyhow, I got embarrassed when the teacher asked for our telephone number. Oh Lord, for the love of me, I couldn't remember our phone number every time someone asked me wahhhh! They might be thinking how irresponsible and dumb I am for not knowing our own number. Good thing hubby was in the rescue. They encouraged the parents to come early in picking up the kids so we could participate to the "Floating Finale" everyday so we could experience some fun of VBS. This will be a great avenue for Rylie to meet other kids and future-teachers. 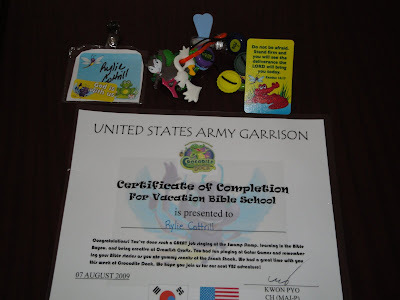 The first time she attended Vacation Bible Study was last year, when we were still in Korea. It wasn't held at our base so they have to drive a couple of hours to go to the venue (other base). It was worth it though because she learned a lot from it. She remembered it very vividly too, just like it was just yesterday. The VBS gave her so much fun and a wonderful experience to remember. Thanks for following, I'll follow you back tomorrow. It's a good thing that Rylie will be attending a vacation Bible Study. My youngest daughter always attend her Sunday Bible school when we go to our local church for our Sunday worship. You can write your house phone number in your address book inside your bag so you can give your phone number to anybody who ask for it. Thanks for the post. God bless you all always. 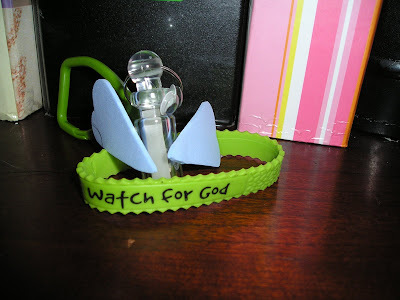 I love the little bracelet that says to watch for God! I am following you from Follow Me Back Tuesday. Love your blog! Im so excited with your little princess attending the VBS... Im sure she will enjoy it very much. We will attending VBS too..but that would be on the first week of August. natural lang yan bading dami mo kasi inaasikaso. si jose nga he is very particular in stuff like that pero one time he forgets our zip code waaaa. I’m a new follower from FMBT! I look forward to reading more of your posts! I'm a new follower from Follow Me Back Tuesday. I hope you'll come check me out at PS Mom Reviews and follow me too! I have fun giveaways going on now, including one for an $80 GC to CSNstores.com! I loved to take my girls to Bible school when they were little. In the summertime, sometimes we would attend a different church every week. They are 14 and 20 now. I miss those days. Following you back from Friendly Friday!